The Black Boar brainchild was directly related to the players’ needs that Tony had discovered through owning Annapolis Billiard Supply. Annapolis Billiards Supply was featuring Scruggs Cues, and they had proven popular. 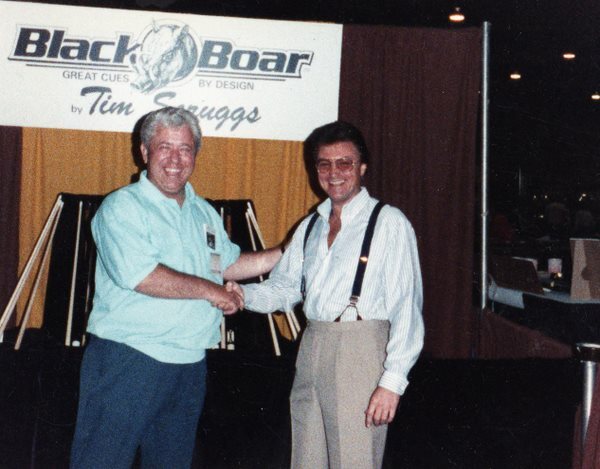 After identifying the need for a new level of professional cue Tony approached Tim Scruggs to play a role in manufacturing the Black Boar concept. Tim responded that he was having finish issues and as a result was overloaded with back orders. Tony, recognizing a perfect opportunity to pick Tim’s brain, volunteered to attempt to solve Tim’s finish problem. While Vince saw to the day in-day out operation of Annapolis Billiards Supply, Tony was tending to the graphics firm in his basement (the only real money maker) and, preferring experience to compensation, working at great length to get Tim caught up. In the meantime, there was a trade show approaching and a self-imposed deadline for the launch of the Black Boar line. With T-shirts made and circulated time was of the essence. Tony and his brother Raymond purchased a CNC mill and Tony, Jr. quickly--- with a pencil and a calculator---began establishing cad cam programs to produce the designs Tony and Vince had created. Tim Scruggs solicited his friend, Bill McDaniels to knock out the first set of 10 blanks. The blanks from McDaniels were just what the doctor ordered… they came over sized without wraps, finish, inlays or shafts. Tim Scruggs and his staff produced the shafts. Tony, Jr. and his father orchestrated all of the inlay work. Tony, Sr. was responsible for leather wraps and finishing the cues. A little known truth is that Mike Cochran (to this day a close personal friend and confidant of Tony, Sr.’s) is another unsung hero. He had a hand in each stage of the operation. Needless to say, the cues were a huge collaborative success. Tony’s inspiration was further fueled by the response from that first show. Based on the initial interest generated, in the following year, Tony and company built the factory in College Park. Tony’s passion to examine the physics to advance the playability of cues made it necessary to have the facilities to produce the cues from end to end. This is the first collection of Black Boar cues. All of these were sold to the Japanese for $10,000, $1,000 a piece. A proud and exciting day for everyone involved. Recognize these strapping young men? Bill McDaniels and Timmy Scruggs demonstrating harmonius cue maker relations. 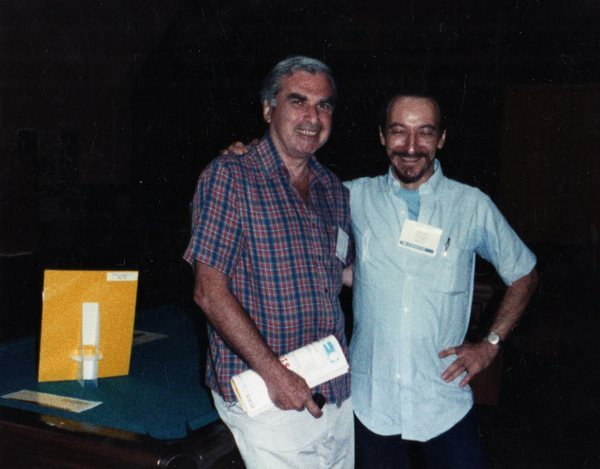 Bill McDaniels was instrumental in creating the first blanks for Black Boar cues. As Tony recalls, this gentleman just happened to be at the show. "If memory serves, he was involved in import and export of condiments (mustard, ketchup, etc.) between Japan and the US." By chance, this man acted as the liason between Tony and Timmy Scruggs, and the Japanese cue buyers. 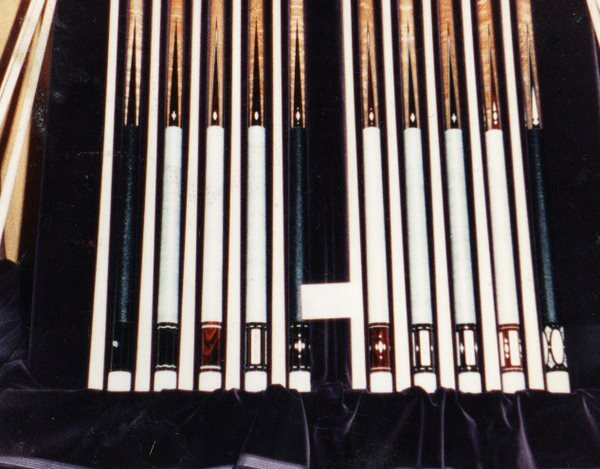 The first set of 10 Black Boar cues were sold to the Japanese for $10,000.